I haven’t been a massive fan of the Supreme Court over the past few years (companies = people, unlimited donations to politicians, etc. ), but I think this is a really important ruling. Just look at Monsanto and how they and their competition have almost completely taken over all agriculture in the US. Can you imagine one of the big biotech firms owning rights on the human body? Yikes. Unfortunately, the ruling only covers natural DNA, not synthetically produced DNA. Thousands of genes have been patented in the United States; some argue that this stifles medical research, while others say it is necessary to support innovation. The Supreme Court gave a mixed ruling on the issue of human gene patents on Thursday, deciding that while DNA found naturally cannot be patented, synthetically produced DNA can. The ruling means that companies will no longer be able to patent a sequence that exactly matches a sequence found in nature. Such sequences have been patented by companies that use them to determine someone’s risk of developing a certain disease. The patent holders have then been able to charge others to use that sequence as part of a medical test. The court’s decision specifically relates to the question of whether one such company, Myriad Genetics, could patent the sequences of two genes, BRCA1 and BRCA2, that are related to the risk of breast and ovarian cancer. Recently, actress Angelina Jolie announced that she underwent a preventive double mastectomy after learning she carried risk mutations in BRCA1. Myriad had held exclusive rights to determine whether a woman carried certain genetic variants in these genes that would predispose her to those cancers. It charged some $3,000 for the test. The court’s decision says that Myriad does not have an exclusive right to test for these variants because they are naturally occurring. However, it also says that if a researcher or lab technician isolates a non-natural version of the gene in question—something known as complementary DNA, or cDNA—that person or company does have the exclusive rights to that sequence. “A naturally occurring DNA segment is a product of nature and not patent eligible merely because it has been isolated, but cDNA is patent eligible because it is not naturally occurring,” the court ruled. The decision could help clarify the best claim strategies for companies developing diagnostic tests (see “Questions over Gene Patents Shake Diagnostics Industry”). In drawing this line between naturally occurring DNA and cDNA, the court was trying to encourage innovation within the industry as well as products derived from nature, says Barbara Rudolph, an expert on biotechnology intellectual property, who is a partner with the law firm Finnegan. “The court noted this balance in the patent system between creating incentives that lead to new invention and impeding access to information that would spur invention,” she says. The distinction lies in the details of molecular biology and the way a gene is prepped to become the recipe for creating a protein. In genomic DNA, genes exist as a mixture of components called exons, which encode the information for making a protein, and noncoding sequences, known as introns. To make a protein, cellular machinery first transcribes a gene—exons, introns, and all—into an intermediary molecule. Cellular machinery then cuts out the introns from that intermediate, creating a mature messenger RNA or mRNA. In a cell, that mRNA would be used as a recipe for making a protein. Scientists can isolate that mRNA and use an enzyme to convert it into DNA, which is called complementary DNA or cDNA. That molecule and its nucleotide sequence, the court writes, does not exist in nature, so they are patentable. In fact, cDNA does exist naturally. Retroviruses such as HIV convert their RNA-based genomes into cDNA before they integrate into a host genome. They do this using the same naturally occurring enzyme that scientists and technicians use to convert an mRNA template into a cDNA. Although there are other ways of synthesizing DNA, the court’s decision emphases that patent eligibility lies in the sequence of that DNA and whether or not it matches a natural DNA sequence. However, “the extent of difference that you are going to need is not clear,” says Rudolph. The real impact of the decision may also be hard to know because technologies have moved beyond the methods patented by Myriad and because the decision focused on a DNA sequence, which is not going to be the focus of every diagnostic test claim. “Every patent claim is different,” Rudolph says. Bottom Line: Soft contact lenses could display information to the wearer and provide continuous medical monitoring. A computer embedded into a contact lens could make for the ultimate heads-up display. For those who find Google Glass indiscreet, electronic contact lenses that outfit the user’s cornea with a display may one day provide an alternative. Built by researchers at several institutions, including two research arms of Samsung, the lenses use new nanomaterials to solve some of the problems that have made contact-lens displays less than practical. A group led by Jang-Ung Park, a chemical engineer at the Ulsan National Institute of Science and Technology, mounted a light-emitting diode on an off-the-shelf soft contact lens, using a material the researchers developed: a transparent, highly conductive, and stretchy mix of graphene and silver nanowires. The researchers tested these lenses in rabbits—whose eyes are similar in size to humans’—and found no ill effects after five hours. The animals didn’t rub their eyes or grow bloodshot, and the electronics kept working. This work is described online in the journal Nano Letters. A handful of companies and researchers have developed electronic contact lenses over the past five years. Sensimed, of Switzerland, makes a lens for 24-hour monitoring of eye pressure in glaucoma patients, and other researchers, including University of Washington professor and Google Glass project founderBabak Parviz, have built contact-lens displays. But these devices have used rigid or nontransparent materials. 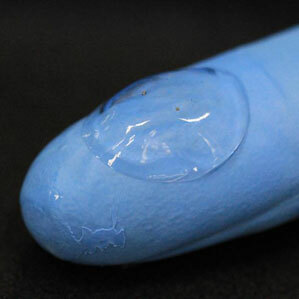 Park wants to make contact lenses that have all the functions of a wearable computer but remain transparent and soft. “Our goal is to make a wearable contact-lens display that can do all the things Google Glass can do,” he says. To make it work, they needed a transparent, highly conductive material that was also flexible. The transparent conductor of choice in conventional rigid electronics, indium tin oxide, is brittle, and it must be deposited at high temperatures that would melt a contact lens. Organic conductors, graphene, and nanowires are flexible and transparent, but they’re not conductive enough. Park, working with Sung-Woo Nam of the University of Illinois at Urbana-Champaign, found that sandwiching silver nanowires between sheets of graphene yielded a composite with much lower electrical resistance than either material alone. The industry standard for a transparent conductor is a resistance of 50 ohms per square or less, says Nam; their material has a resistance of about 33 ohms per square. The material also transmits 94 percent of visible light, and it stretches. The researchers make these conductive sheets by depositing liquid solutions of the nanomaterials on a spinning surface, such as a contact lens, at low temperatures. Working with researchers at Samsung, they coated a contact lens with the stretchy conductor, then placed a light-emitting diode on it. Although it would be an exaggeration to call this a display, since there is just one pixel, it’s possible this kind of material will be a necessary component in future contact-lens displays, says Herbert De Smet, who works on electronic contact lenses at Ghent University in Belgium but was not involved with the work. Nam believes medical applications of electronic contact lenses may be even more promising than eyeball-mounted displays. He is currently using the graphene-nanowire conductors to make biosensors that could monitor health conditions by sampling the chemistry of the eye’s tear film. And De Smet’s group is developing lenses that can actively filter light to compensate for vision problems.